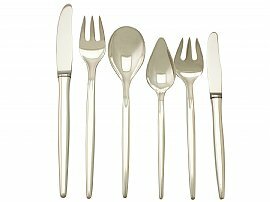 The pieces of this exceptional vintage sterling silver flatware service for six persons has been crafted in the Design style. The tapering rounded handle of each piece is plain and unembellished, apart from the featured hallmarks to the posterior surface. The original sterling silver forks have three tines/prongs. 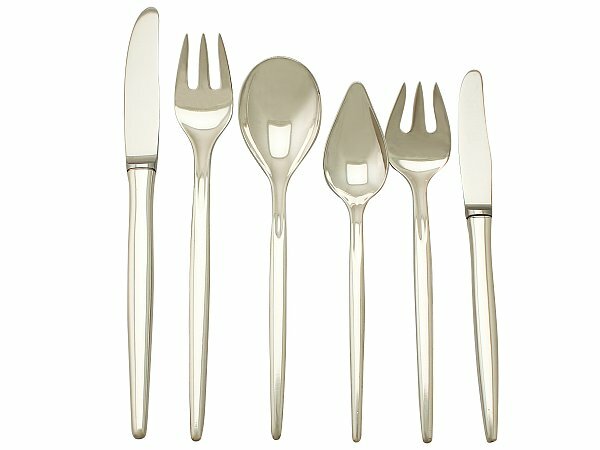 The fundamental pieces of this Design style cutlery set, including the knives, have been crafted by the Danish silversmith Anton Michelsen in Copenhagen. This vintage canteen of cutlery is an exceptional gauge of silver, exceptional quality and in exceptional condition. Full Danish hallmarks struck to the reverse of each piece are all very clear; hallmarks are deeply struck due to the exceptional gauge of silver.